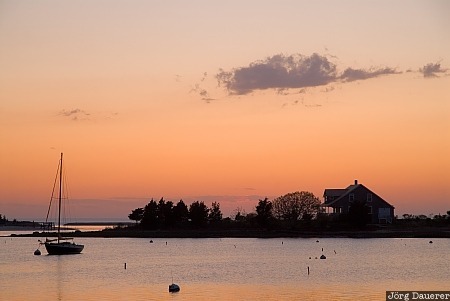 Sunset over Buzzards Bay near West Falmouth behind the silhouette of a sailing boat and a house. West Falmouth is on Cape Cod at the Atlantic coast of Massachusetts, United States. This photo was taken in the evening in May of 2010. This photo was taken with a digital camera.